Slaughtneil teams have never been known to flinch in the face of a challenge but the Emmet’s will need all their mental resolve against Leinster champions St. Vincent’s in Saturday’s All Ireland Senior Club semi-final in Newry. And the contrast between the clubs could not be more severe. The small but remarkable three-in-a-row Derry champions facing the might of the Malahide Road men from North Dublin whose large catchment area is Marino. Four years ago, then Derry champions Ballinderry lost to St. Vincent’s who went on to win the title and the Dubs are favourites agains given their greater experience at this level. They have won the Leister title six times (1972, 1975, 1984, 2007, 2013 and 2014) with three All Ireland titles in 1976, 2008 and 2015. Slaughtneil have really come to the fore since appointing Mickey Moran as manager. 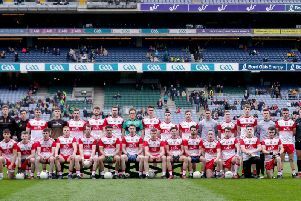 His aim was to win a Derry title within three years but three years on from that appointment, they have won three Derry and two Ulster titles as well as contesting an All Ireland final. There is no doubt that the Emmet’s are a better balanced team now than they were three years ago. A number of younger players have come in to freshen things up. They have a cast iron defence that has not conceded a single goal in eight championship games. They may not score an awful lot but they are superb at playing the possession game and making the opposition do the chasing. If they can curb the threat of Dublin star Diarmuid Connolly, arguably the most gifted Gaelic footballer of his generation, it will go a long way towards victory. To date, versatile defender Karl McKaigue has the Slaughtneil man to snuff out dangerous forwards and he could be earmarked to track Connolly. Slaughtneil’s Patsy Bradley and Padraig Cassidy have won every midfield battle on their Championship run and there’s nothing to suggest they can’t at least hold their own against, Daithi Murphy and Shane Carberry. Indeed the Dublin and Leinster champions must have had a few worries in this area when they played Connolly in the No. 8 shirt in earlier games. The Dublin championship is probably the toughest to win in the entire GAA. They have a massive 32 clubs but Dublin club teams are often backboned by players from other counties who work or live in the city and the current St. Vincent’s full-forward is Mayo player Enda Varley. St. Vincent’s won their 28th Dublin title by defeating surprise packages Casteknock in the final by 0-15 to 0-10. They had opened their campaign with a victory over Erin’s Isle and it took five games in quick succession for them to emerge as the Dublin winners. St. Vincent’s are one of the most prestigious clubs in Dublin with an adult player membership fee of E220 per year. They field four adult football teams and three adult hurling teams plus numerous under age teams. They are also strong in camogie and have won the last two Dublin titles. The most direct link between St. Vincent’s and Derry comes in the shape of Brian Mullins the last man to manage Derry to an Ulster championship title. Mullins, one of the greatest midfielders of all time, came to teach in Donegal during the 90s and took over as manager from Mickey Moran in 1997. He is now back in Dublin as head of sport in UCD and is still involved with his club. Slaughtneil will be well prepared despite a double up in their panel with the club hurlers who play another Dublin team, Cuala, in two weeks in the All Ireland Senior Club Hurling semi-final. Mickey Moran has coached Derry to an All Ireland title, John Joe Kearney has won an All Ireland minor medal and managed Derry to the 1989 minor title where Willie Hampson was one of his selectors and there is little these three wise men do not know about football. They have conceded an average of only eight points per game though they did get it tight in Ulster with narrow wins over Derrygonnelly (Fermanagh), Killyclogher (Tyrone) and Kilcoo (Down) but never looked like losing any of them. Outside of Dublin, Leinster football is poor and once they won the Dublin title St. Vincent’s received a bye into the quarter final where they defeated Pallatine of Wicklow. In the semi-final they had to work hard to beat St. Columba’s Mullinalgata from Longford. In the final they faced much stronger opposition against an experienced Rhode team from Offaly. The Dublin team won by a rather flattering 1-16 to 0-12 to take their third provincial title in four years. Slaughtneil are likely to line out along familiar lines as they appear to be injury free. The Vincent’s too are not likely to make any sweeping changes in a team where former Dublin player, Ger Brennan, is a rock at centre half. Their forward line will be the best that Slaughtneil have faced so far. Veteran Thomas ‘Mossy’ Quinn is an ace free taker and the central attacking pairing of Connoly and Varley will need to be closely marked. St. Vincent’s manager Paul Stephens will not be taking anything for granted against the Derry champions whose triple Ulster success is the talk of the GAA. If Slaughtneil can curb Connolly, they could be on their way to a second All Ireland final in three years. Their likely line out will be Antoin McMullan, Francis McEldowney capt, Brendan Rogers, Karl McKaigue, Paul McNeill, Chrissy McKaigue, Keelan Feeney, Patsy Bradley Padraig Cassidy, Shane McGuigan, Paul Bradley, Meehaul McGrath, Christopher Bradley, se McGuigan, Cormac O’Doherty. The St. Vincent’s line out in the Leinster final was Michael Savage, Michael Concar, Jarleth Curley, Craig Wilson, Nathan Mullins, Ger Brennan, Cameron Diamond, Daithi Murphy, Shane Carbery, Gavin Burke, Diarmuid Connolly, Cormac Diamond, Ruairi Treanor, Enda Varley, Mossy Quinn. Slaughtneil will have a huge swell of support from their own club and others from all over the county. They are a tight knit bunch of players who will not give an inch in pursuit of victory.